Beth Henley writes great scripts for strong women. That reason alone, was impetus to see "Abundance" at Hartford Stage. The premise is promising. Two mail-order brides travel to Wyoming in the 1860's and strike up a friendship that ultimately withstands husbands, famine, homesteading, the coming of the railroad, Indians, anniversaries, successes and failures. 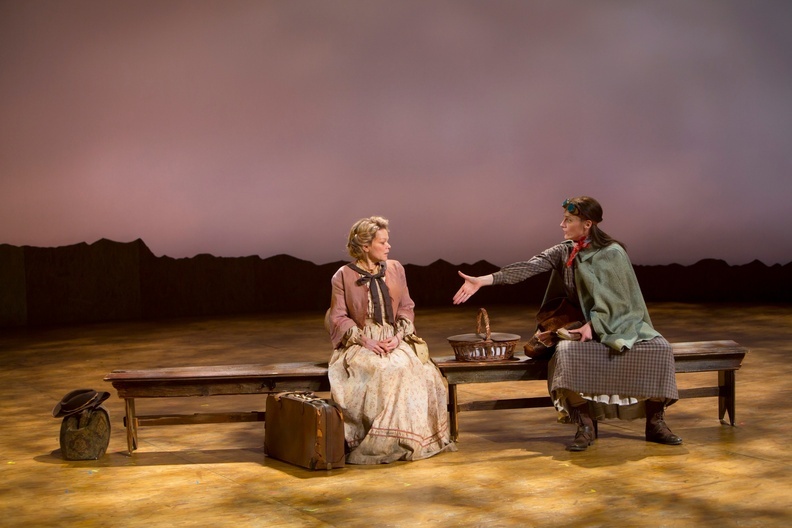 Billed as “wickedly funny and deeply touching” the dialog is strong and the actors infuse their characters with energy, but the play lumbers along. The laugh lines are clever, but the play is anything but a comedy. The female leads, Bess (Monique Vukovic) and Macon (Brenda Withers), are talented actors who work well together, but though their their characters' 25-year friendship is challenged by extraordinary events, it’s hard to see the emotional turmoil between them as their lives unfold. The actors playing their husbands -- the sadistic Jack (James Knight) and the good, but dim William (Kevin Kelly) -- are also fine actors, but the roles are stereotypical and it’s unclear what makes each man change over the years. Tracy Christensen’s costumes are perfect, and Philip S. Rosenberg’s lighting design are standout contributions to creating mood. The large playing space and the spare set reinforce the wide open spaces of the west, but director Jenn Thompson uses the revolving stage far more than necessary and she often blocks her actors to speak upstage, for no real reason. Wilson Chin’s scenic design is highly representative, but the actors are directed to break walls and violate the audience’s sense of space. It is questionable whether Henley’s script calls for the Shaker hymn, “Simple Gifts,” or whether the sound designer or the director chose this music to signal time passage, but the tune seems inappropriate and overused. The production has potential to grow throughout the run, but unfortunately at this point, "Abundance" leaves this reviewer unfulfilled.